Breathtaking views, unforgettable cuisine, and heavenly beaches. 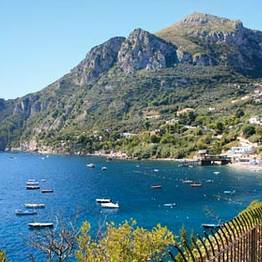 The little town of Sant'Agata is situated 27 kms east of the Amalfi Coast and can be reached by car or one of the buses run by the Sita Coach Company, via the Nastro Azzurro road between Sorrento and Sant'Agata sui Due Golfi, or the Nastro Verde road, from Massa Lubrense. From Sant'Agata, the road leads down to the fishing village of Nerano, also served by Sita buses. 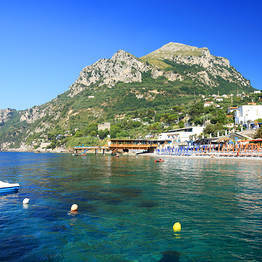 A view which will leave you lost for words, and the most strategic position on the whole of the Amalfi Coast. This is Sant'Agata sui due Golfi, the pretty little town straddling the hill between the bays of Naples and Salerno. 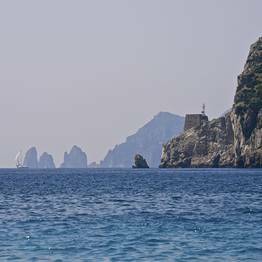 What's more, the town boasts a unique view of the legendary Island of Capri and the archipelago of Li Galli. The remains of a number of necropolis testify to the presence of the Ancient Greeks and the Etruscans in the area surrounding the town of Sant'Agata, which in the 19th century, became an obligatory port of call on the Grand Tour. 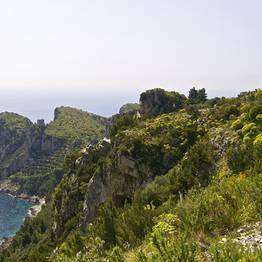 On one side, the Bay of Naples and Mount Vesuvius, on the other , the Bay of Salerno, the islets of Li Galli and the Amalfi Coast. Opposite, almost within swimming distance, Capri. Perched on a hilltop, and within easy walking distance of the main square in Sant'Agata, the Monastero del Deserto, was constructed by Carmelite monks in 1679. Another house of worship worth visiting is the Church of Santa Maria delle Grazie, famous for its precious altar of inlaid wood and mother pearl. 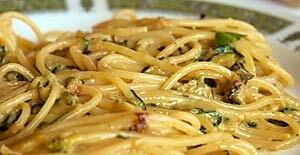 One of Sant'Agata sui Due Golfi's best guarded treasures is its culinary tradition. This is where the great chef Alfonso Iaccarino and his Michelin starred "Don Alfonso 1890", in Corso Sant'Agata no.11, reigns supreme. 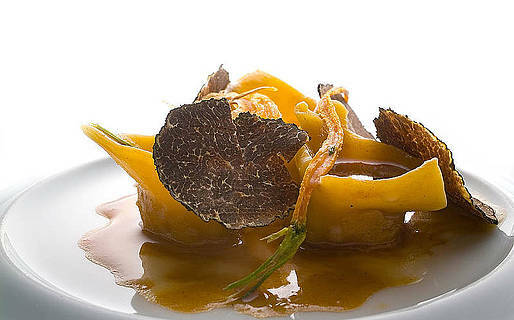 If you'd rather eat somewhere more "modest, you'll love the good, honest home cooking served at the "Lo Stuzzichino", restaurant, directly opposite Don Alfonso. The area's passion for good food is hardly surprising considering the abundance of high quality ingredients produced here, such as the "Sant Anna" tomato, "femminiello ovale" lemon, and Monti Lattari cheese. A trip to the area's farms and dairies is the perfect opportunity to stock up on delicious edible souvenirs. 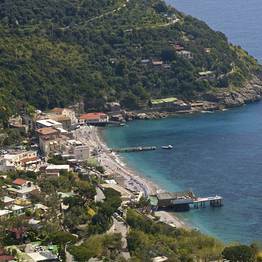 Near to Sant'Agata, the fishing village of Nerano, represents yet another fragment of paradise on the Amalfo Coast, famous for its underwater caves, pretty historic center, and typical restaurants . 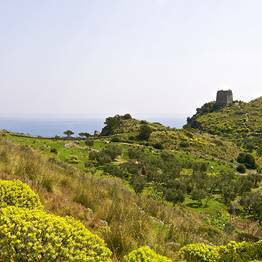 The village is said to have acquired its name after the emperor Tiberius Nerone built a summer residence here. 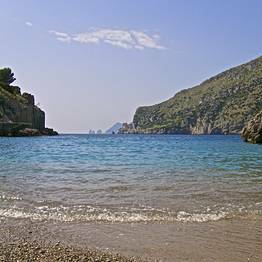 As in the times of the Roman Empire, Nerano and Sant'Agata continue to attract well-heeled holidaymakers with their beautiful little beaches and secluded coves. 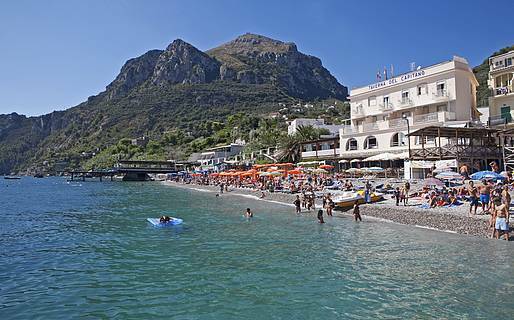 Nerano's beach faces onto the bay of Marina del Cantone, the rocky seabed and transparent waters of which make it a well established favorite among scuba divers. The area is in the center of the Punta Campanella Natural Marine Reserve. From the right hand corner of Cantone beach, visitors can access the panoramic footpath which leads to the Recommone beach, which is covered in white pebbles. All the restaurants on the beach of Marina del Cantone serve Spaghetti alla Nerano , although to taste the "original recipe" you'll need to go to "Mariagrazia", where the dish so loved by the famous Neapolitan comedian, Toto, was first invented. 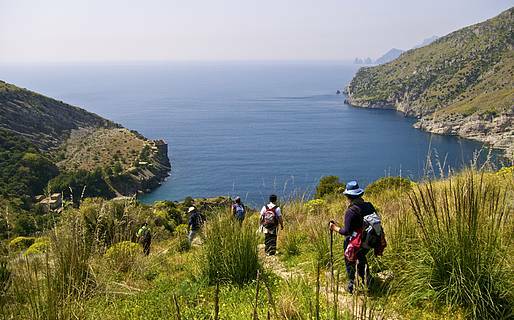 Via the footpath which starts in the main square in Nerano, walkers come to the Bay of Ieranto, owned by the F.A.I. (Italian Environmental Foundation) which aims to protect its status as the only intact bay on the Sorrentine Peninsola. A number of important archeological findings have been made here, which indicate the presence of an ancient temple in the bay, built in homage to the Sirens and later dedicated to the Goddess Athena. 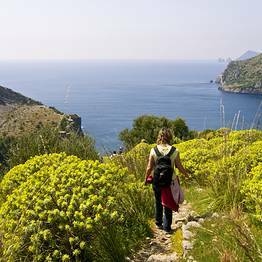 The path leading to the Ieranto Bay begins in Nerano and, in just over an hour, brings walkers to this small bay, directly opposite the Island of Capri and the legendary Faraglioni rocks. 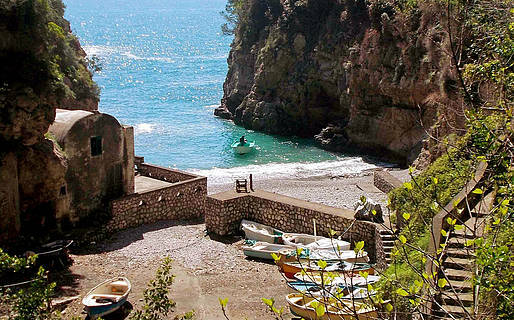 If you don't feel up to making the long walk to Ieranto (much of which is uphill) you can reach the little beach by boat, using the Sant'Antonio Cooperative's "sea taxi" service from Marina del Cantone (+39-0818081638). From the town of Sant'Agata sui Due Golfi, you can easily reach the district of Torca and from here, take the via Pedara, and walk down the 700 steps leading to the Crapolla fiord. Along the way, you'll come across the Chapel of San Pietro, built on the remains of an impressive 11th century abbey. The descent is not particularly taxing and takes circa 45 minutes, the ascent is decidedly more difficult and best made when the temperature begins to drop, as the sun sets. An effort amply rewarded by the magic of a place in which time seems to have stood still for centuries.